These terms and conditions apply to the Braverman Jewelry Web site located at www.bravermanjewelry.com, and all associated Web sites linked to www.bravermanjewelry.com by Braverman Jewelry, its subsidiaries and affiliates, including Braverman Jewelry's sites around the world. These Terms and Conditions govern your use of, and any purchase from, the Braverman Jewelry Site, and constitute an agreement between you and Braverman Jewelry. Braverman Jewelry reserves the right to change or modify any of these Terms and Conditions or any policy or guideline of the Site at any time, and in its sole discretion. Any change or modification will be effective immediately upon posting of the revisions on the Site. Your continued use of the Site following the posting of its changes or modifications will constitute your acceptance of such changes or modifications. Therefore, you should frequently review these Terms and Conditions and any other applicable policies from time-to-time to understand the terms and conditions that apply to your use of the Site. If you do not agree to the amended terms, you must stop using the Site. If you are interested in a piece of jewelry that is currently on back order, call us and we can tell you when the item will be back in stock. Sometimes with the volume of orders we receive, an item may go out of stock before we are able to post a notification on the Site. If this happens, we will contact you directly to discuss possible options. Data, including prices, may be inaccurately displayed on our Site due to system or typographical errors. While we make every attempt to avoid these errors, they may occur. We reserve the right to correct any and all errors when they do occur, and we do not honor inaccurate or erroneous prices. If a product's listed price is lower than its actual price, we will, at our discretion, either contact you for instructions before shipping the product or cancel the order and notify you of such cancellation. If the order has been shipped, you agree to either return the product or pay the difference between the actual and charged prices. Our prices are also subject to change without notice. We apologize for any inconvenience that this may cause. 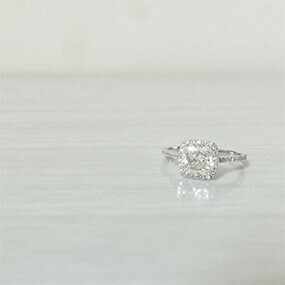 If you have any questions, please do not hesitate to contact one of our Diamond and Jewelry Consultants. When you order a loose diamond, we ship it to you with the accompanying diamond grading report (also called a diamond certificate). These grading reports are detailed documents created by diamond grading experts at one of two highly-respected diamond laboratories - making it very expensive to replace a diamond grading report. Because of this, we require each diamond grading report to be included with each returned diamond. If you do not include the diamond grading report with your return, you will be charged a replacement fee of US$250 (or equivalent amount in other currencies). To keep our prices low, we do not allow comparison purchasing. Comparison purchasing is the act of buying several items with the intent of keeping the one you like best and returning the remainder. This causes undue restocking and inventory overhead and can be very costly. To confirm the quality of a jewelry item, please contact one of our Diamond and Jewelry Consultants and we would be happy to help you make your choice. 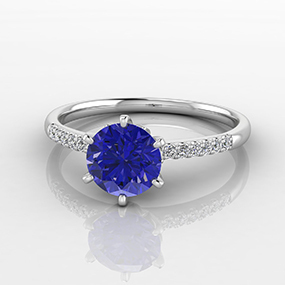 At Braverman Jewelry, we make every attempt to ensure that our online catalog is as accurate and complete as possible. In order to give you the opportunity to view our products in great detail, some products may appear larger or smaller than their actual size in our photographs; and since every computer monitor is set differently, color and size may vary slightly. Our objective is to provide you with as much information and detail about your prospective purchase as possible so that you can see the beauty and shape of a particular item. In compliance with industry standards and FTC regulations, Braverman Jewelry states that carat total weight in all purchases may vary 0.08 carats from stated weight. 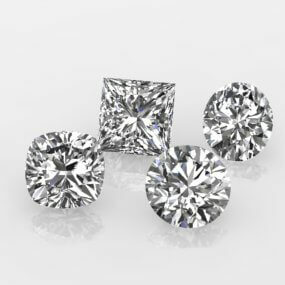 At Braverman Jewelry, we only purchase diamonds through the largest and most respected suppliers who, like us, proudly adhere to and enforce the standards established by the Kimberley Process, an international system that polices the trade of diamonds to ensure they are from sources free of conflict. Read more about Braverman Jewelry's policy and the steps we take to ensure our diamonds are from conflict free sources. The Site and all content and other materials, including, without limitation, the Braverman Jewelry logo, and all designs, text, graphics, pictures, selection, coordination, 'look and feel', information, data, software, sound files, other files and the selection and arrangement thereof (collectively, the "Site Materials") are the proprietary property of Braverman Jewelry or its licensors or users and are protected by trade dress, copyright, patent and trademark laws, and various other intellectual property rights and unfair competition laws. Braverman Jewelry logos, and any other product or service name or slogan contained in our Site are trademarks of Braverman Jewelry and its suppliers or licensors, and may not be copied, imitated or used, in whole or in part, without the prior written permission of Braverman Jewelry or the applicable trademark holder. You may not use any metatags or any other "hidden text" utilizing "Braverman Jewelry" or any other name, trademark or product or service name of Braverman Jewelry without our prior written permission. All other trademarks, registered trademarks, product names and Braverman Jewelry names or logos mentioned in our Site are the property of their respective owners. You are granted a personal, limited, non-sublicensable license to access and use our Site and electronically copy, (except where prohibited without a license) and print to hard copy portions of our Site Materials for your informational, non-commercial and personal use only. Such license is subject to these Terms and Conditions and does not include: (a) any resale or commercial use of our Site or the Site Materials therein; (b) the collection and use of any product listings, pictures or descriptions for commercial purposes; (c) the distribution, public performance or public display of any Site Materials, (d) modifying or otherwise making any derivative uses of our Site and the Site Materials, or any portion thereof; (e) use of any automated means to access, monitor or interact with any portion of our Site, including through data mining, robots, spiders, scraping, or similar data gathering or extraction methods; (f) downloading (other than the page caching) of any portion of our Site, the Site Materials or any information contained therein, except as expressly permitted on our Site; (g) cause to appear any pop-up, pop-under, exit windows, expanding buttons, banners, advertisement, or anything else which minimizes, covers, or frames or inhibits the full display of our Site; (h) use our web sites in any way which interferes with the normal operation of our sites; or (i) any use of our Site or the Site Materials other than for its intended purpose. Any use of our Site or the Site Materials other than as specifically authorized herein, without the prior written permission of Braverman Jewelry, is strictly prohibited and will terminate the license granted herein. Such unauthorized use may also violate applicable laws, including without limitation copyright and trademark laws and applicable communications regulations and statutes. Unless explicitly stated herein, nothing in these Terms and Conditions shall be construed as conferring any license to intellectual property rights, whether by estoppel, implication, or otherwise. This license is revocable at any time. In accordance with the Digital Millennium Copyright Act (DMCA) and other applicable law, Braverman Jewelry has adopted a policy of terminating and barring, in appropriate circumstances and at Braverman Jewelry's sole discretion, site users or account holders who are deemed to be repeat infringers. Braverman Jewelry may also at its sole discretion limit access to this site and/or terminate the accounts of any users who infringe any intellectual property rights of others, whether or not there is any repeat infringement. Braverman Jewelry may provide links to Web pages and content of third parties ('Third Party Content') as a service to those interested in this information. Braverman Jewelry does not monitor or have any control over any Third Party Content or third party Sites. Braverman Jewelry does not endorse any Third Party Content and can make no guarantee as to its accuracy or completeness. Braverman Jewelry does not represent or warrant the accuracy of any information contained therein, and undertakes no responsibility to update or review any Third Party Content. Users use these links and Third Party Content contained therein at their own risk. Braverman Jewelry may run advertisements and promotions from third parties on our Site. Your business dealings or correspondence with, or participation in promotions of, advertisers other than Braverman Jewelry, and any terms, conditions, warranties, or representations associated with such dealings, are solely between you and such third party. Braverman Jewelry is not responsible or liable for any loss or damage of any sort incurred as the result of any such dealings or as the result of the presence of such non-Braverman Jewelry advertisers on our Site. You acknowledge and agree that any materials, including but not limited to questions, comments, suggestions, ideas, plans, notes, drawings, original or creative materials or other information, regarding this site, Braverman Jewelry, or our products or services that are provided by you to Braverman Jewelry are non-confidential and shall become the sole property of Braverman Jewelry. Braverman Jewelry will own exclusive rights, including all intellectual property rights, and will be entitled to the unrestricted use and dissemination of these materials for any purpose, commercial or otherwise, without acknowledgment or compensation to you. You grant Braverman Jewelry and its affiliates and sublicensees the right to use the name that you submit in connection with such content, if they choose. You represent and warrant that (a) you own and control all of the rights to the content that you submit, or that you otherwise have the right to submit such content to this site; (b) the content is accurate and not misleading; and (c) use and posting of the content you supply will not violate any rights of or cause injury to any person or entity. User Content that, in the sole judgment of Braverman Jewelry, is objectionable or which restricts or inhibits any other person from using or enjoying the Interactive Areas or our Site, or which may expose Braverman Jewelry or its users to any harm or liability of any type. If you post User Content to our Site, unless we indicate otherwise, you grant Braverman Jewelry and its affiliates a nonexclusive, royalty-free, perpetual, irrevocable and fully sublicensable right to use, reproduce, modify, adapt, publish, translate, create derivative works from, distribute, perform and display such User Content throughout the world in any media. You grant Braverman Jewelry and its affiliates and sublicensees the right to use the name that you submit in connection with such content, if they choose. You represent and warrant that (a) you own and control all of the rights to the User Content that you post or you otherwise have the right to post such User Content to our Site; (b) the User Content is accurate and not misleading; and (c) use and posting of the User Content you supply does not violate these Terms and Conditions and will not violate any rights of or cause injury to any person or entity. We will make reasonable commercial efforts to ensure that our web site is available 24 hours per day without any interruptions. However, we may make our web site and/or our services unavailable at any time or restrict access to parts or all of our web site, if we need to update or change our servers. You agree to defend, indemnify and hold harmless Braverman Jewelry, its independent contractors, service providers and consultants, and their respective directors, employees and agents, from and against any claims, damages, costs, liabilities, and expenses (including, but not limited to, reasonable attorneys' fees) arising out of or related to any Content you post, store or otherwise transmit on or through our Site or your use of or inability to use our Site, including without limitation any actual or threatened suit, demand or claim made against Braverman Jewelry and/or its independent contractors, service providers, employees, directors or consultants, arising out of or relating to the Content, your conduct, your violation of these Terms and Conditions or your violation of the rights of any third party. EXCEPT AS EXPRESSLY PROVIDED TO THE CONTRARY IN A WRITING BY BRAVERMAN JEWELRY, THIS SITE, THE CONTENT CONTAINED THEREIN AND THE PRODUCTS AND SERVICES PROVIDED ON OR IN CONNECTION THEREWITH (THE "PRODUCTS AND SERVICES") ARE PROVIDED ON AN "AS IS" BASIS WITHOUT WARRANTIES OF ANY KIND, EITHER EXPRESS OR IMPLIED. BRAVERMAN JEWELRY DISCLAIMS ALL OTHER WARRANTIES, EXPRESS OR IMPLIED, INCLUDING, WITHOUT LIMITATION, IMPLIED WARRANTIES OF MERCHANTABILITY, FITNESS FOR A PARTICULAR PURPOSE, TITLE, AND NON-INFRINGEMENT AS TO THE INFORMATION, CONTENT, AND MATERIALS IN OUR SITE. BRAVERMAN JEWELRY DOES NOT REPRESENT OR WARRANT THAT MATERIALS IN OUR SITE OR THE SERVICES ARE ACCURATE, COMPLETE, RELIABLE, CURRENT OR ERROR-FREE. BRAVERMAN JEWELRY DOES NOT REPRESENT OR WARRANT THAT OUR SITE OR ITS SERVERS ARE FREE OF VIRUSES OR OTHER HARMFUL COMPONENTS. IN NO EVENT SHALL BRAVERMAN JEWELRY, ITS DIRECTORS, MEMBERS, EMPLOYEES OR AGENTS BE LIABLE FOR ANY DIRECT, SPECIAL, INDIRECT, OR CONSEQUENTIAL DAMAGES, OR ANY OTHER DAMAGES OF ANY KIND, INCLUDING BUT NOT LIMITED TO LOSS OF USE, LOSS OF PROFITS, OR LOSS OF DATA, WHETHER IN AN ACTION IN CONTRACT, TORT (INCLUDING BUT NOT LIMITED TO NEGLIGENCE) OR OTHERWISE, ARISING OUT OF OR IN ANY WAY CONNECTED WITH THE USE OF OUR SITE, THE PRODUCTS AND SERVICES, OR THE CONTENT CONTAINED IN OR ACCESSED THROUGH OUR SITE, INCLUDING WITHOUT LIMITATION ANY DAMAGES CASED BY OR RESULTING FROM RELIANCE BY USER ON ANY INFORMATION OBTAINED FROM BRAVERMAN JEWELRY, OR THAT RESULT FROM MISTAKES, OMISSIONS, INTERRUPTIONS, DELETION OF FILES OR EMAIL, ERRORS, DEFECTS, VIRUSES, DELAYS IN OPERATION OR TRANSMISSION OR ANY FAILURE OF PERFORMANCE, WHETHER OR NOT RESULTING FROM ACTS OF GOD, COMMUNICATIONS FAILURE, THEFT, DESTRUCTION OR UNAUTHORIZED ACCESS TO BRAVERMAN JEWELRY'S RECORDS, PROGRAMS OR SERVICES. (ii) The party receiving the Dispute Notification has thirty (30) days from receipt of the Dispute Notification to respond. (iii) The other party then has 15 days to consider the response and reply. (b) Mediation. If the dispute is not resolved informally, either party may make a demand for mediation, with the other party’s consent, by filing a: (i) Request for AAA Online Mediation with the American Arbitration Association (“AAA”); or (ii) Request for Mediation with the AAA. To file a request for mediation, you must go to the following website: www.ard.org. If either party requests mediation and both parties consent to mediation, the costs of mediation will be borne equally by the parties. (c) ARBITRATION. IF MEDIATION DOES NOT OCCUR OR IF MEDIATION DOES NOT RESOLVE THE DISPUTE, THEN BOTH PARTIES AGREE TO ARBITRATE ANY DISPUTES THEY HAVE WITH THE OTHER SO LONG AS SUCH DISPUTES ARE ARISING OUT OF OR RELATED TO THIS AGREEMENT. SPECIFICALLY, YOU AGREE THAT, BY AGREEING TO THESE TERMS, THE FEDERAL ARBITRATION ACT GOVERNS SECTION 20(B) AND THAT YOU AND BRAVERMAN JEWELRY ARE EACH WAIVING THE RIGHT TO A TRIAL BY JURY INVOLVING ALL DISPUTES, CLAIMS AND CONTROVERSIES, OF ANY SORT OR NATURE, BETWEEN US, ARISING OUT OF THE USE OF THE SITE AND WAIVING THE RIGHT TO PARTICIPATE IN A CLASS, COLLECTIVE, OR REPRESENTATIVE ACTION REGARDING ANY DISPUTE. YOU AND BRAVERMAN JEWELRY AGREE THAT ANY DISPUTE SHALL BE RESOLVED ON AN INDIVIDUAL BASIS ONLY. YOU MUST FILE ANY DEMAND FOR ARBITRATION YOU MAY HAVE WITH THE AMERICAN ARBITRATION ASSOCIATION (“AAA”). SUCH ARBITRATION IS FINAL AND BINDING AND WILL BE GOVERNED BY THE COMMERCIAL ARBITRATION RULES AND THE SUPPLEMENTARY PROCEDURES FOR CONSUMER RELATED DISPUTES (COLLECTIVELY, "AAA RULES"). THE DECISION OF THE ARBITRATOR(S) SHALL BE BINDING AND ENFORCEABLE IN ANY COURT OF COMPETENT JURISDICTION. (d) CLASS ACTION WAIVER. YOU AND BRAVERMAN JEWELRY EXPRESSLY AGREE THAT: (i) EACH PARTY MUST BRING CLAIMS AGAINST THE OTHER ONLY IN AN INDIVIDUAL CAPACITY, AND NOT AS A PLAINTIFF OR CLASS MEMBER IN ANY PURPORTED CLASS, MASS, COLLECTIVE, OR REPRESENTATIVE PROCEEDING; (ii) THERE SHALL BE NO CLASS CLAIMS, CONSOLIDATION, OR JOINDER ALLOWED IN ANY ARBITRATION BETWEEN THE PARTIES; AND (iii) NO CLAIMS MAY BE MADE THROUGH AN ACTION PURPORTING TO REPRESENT A CLASS OF USERS OR OTHERWISE ASSERTING CLAIMS ON BEHALF OF A CLASS (“CLASS ACTION WAIVER. This Dispute Resolution section shall survive termination of this Agreement. You agree that Braverman Jewelry may modify these Terms and Conditions and any other policies on our Site at any time and that posting the modified Terms and Conditions or policies on our Site will constitute sufficient notice of such modification. Notwithstanding any of these Terms and Conditions, Braverman Jewelry reserves the right, without notice and in its sole discretion, to terminate your license to use this site, and to block or prevent future your access to and use of the Site. If you have any questions, please do not hesitate to contact one of our Diamond and Jewelry Consultants.